Two years ago, I went on a trip to Disney World with my partner during Reading Week. The trip would be my 5th time to “the World” but my first time going without the family, including my mom who is obsessed with taking the same pictures, by the same landmarks every time we go. Having to stop what we were doing, put on our “family fun” faces and inevitably get in the way of all the other guests in the park was frustrating and uncomfortable, especially in the 90F Florida weather. This was the first time I was in control of the memories and with a camera phone in tow, I made sure all the photos were taken quickly, without impeding on the space of other people, but also of new experiences in the parks. I decided then, that I wanted to revise my memories through tourist photos of the food we ate during our trip. Dining experiences at Disney World are unique in that most of the restaurants are themed, but the moments there are most fleeting as food is often consumed quickly so that guests can continue on with their day. With nearly a hundred of restaurants to choose from, it is difficult to get the same dining experience every time you go. Our dining experience were in fact, informed by my picture taking. I made sure that my partner and I never ordered the same thing so that we could experience as many dishes as possible. I also made sure that we posed with our dishes so we remembered who ate what, but also because I believe photos are more meaningful with people in them. It is what sets my photos apart from other people’s tourist photos. Although people are highly criticized for taking pictures of their food, producers of the #foodselfie seek to preserve the results of their time/money spent on daily sustenance. Jonas Larson states that “much tourist photography is about ‘consuming’ significant places” (25). Is it far off to consider tourist food photography about ‘consuming’ what is consumed? #foodselfie’s are subversive at Disney World because they do not fit within the regulated “Kodak Photo Spots” designed to control which memories and spaces are captured. 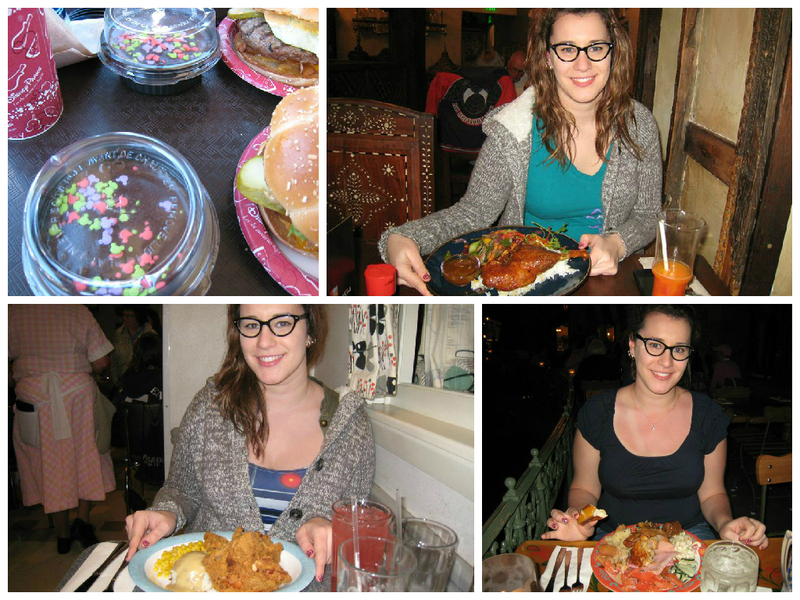 Most of all, #foodselfie’s are fun and undoubtedly mass-produced, but what isn’t in Disney World anyways?